I read the Atlanta Journal Constitution and the Wall Street Journal daily. Like a little bundle of Christmas joy, they are waiting for me in my driveway each morning. I don’t know if it’s habit, nostalgia, or the fact I can read on the exercise bike without worrying about how well (or not) sweat and an iPad mix. But for whatever reason, though I spend plenty of time consuming information online, I still prefer the feel of a physical newspaper, reading (at least scanning) each and every page. I recently discovered that this increasingly rare habit of mine may actually be helping me maintain an open mind and even develop my creativity. How can that be? I made this observation after reading “The Filter Bubble”, by Eli Pariser. I came across this book as part of my first Coursera course, entitled “Understanding Media by Understanding Google”. Coursera is an online education platform that partners with top universities to offer courses online for anyone to take, for free. If you consider yourself a lifelong learner, you’re going to eat it up Video lectures, readings, quizzes, essays (peer graded) – I found it surprisingly engaging. Remember when this was it? Back to the media and the ‘filter bubble’. When the Internet first became prominent, we all reveled in our newfound freedom from the information gatekeepers, the local paper and the major networks through which we received all our information (sorry, Walter Cronkite). We wandered the web perhaps starting with portals like Yahoo.com (gatekeepers in their own right) as our jumping off point. However, now we simply search for what we’re looking for, nearly always with Google. To illustrate, I just visited Fox News and was presented with an ad for the hotel in Syracuse where we actually stayed two weeks ago – guess they want me back. Google knows I have an interest in this hotel in Syracuse. When I search for “North Carolina” in Google, I’m presented at the top with a box highlighting the football game tomorrow night between UNC and Duke that I am attending! Google knows I’m a Duke football fan, so has a hunch I might be looking for info about the game this week. Meanwhile, when I repeat these steps on a seldom-used PC I have laying around, I don’t see the hotel ad and nothing is presented about the football game. My wife and I ran a similar experiment recently – I was presented with lots of ads for Swatch (which I collect), while she was presented ads for drug stores and women’s magazines. Once you start noticing the dynamic content being presented to you, it’s a tad creepy! Pariser’s point is that the gatekeepers have returned: they’re just not the human editors anymore – they’ve become algorithms! 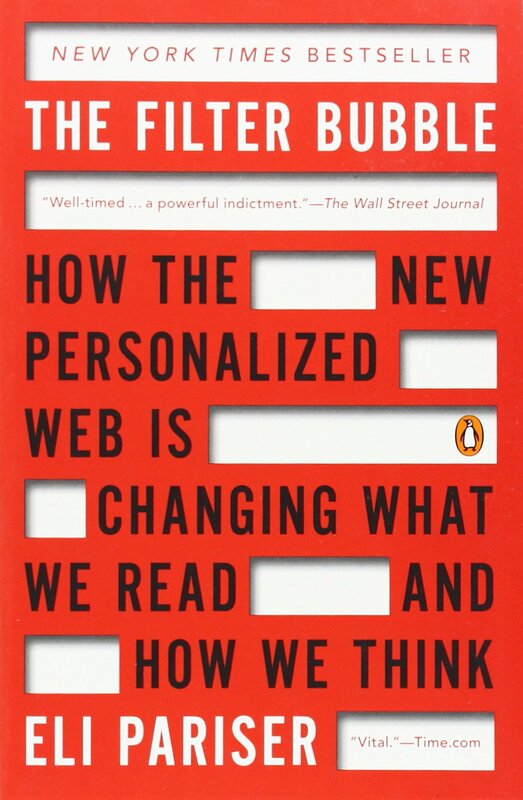 He coins the term ‘filter bubble’ to represent the personal media experience in which each individual lives. You’re alone in it; it’s invisible; you don’t choose to be in it. Is there anything ‘bad’ about this? Don’t we want to see information germane to us, and not just content from the highest bidder? Overall, I see personalization as a strong net positive, but the danger, per Pariser is the loss of serendipity, or a fortunate happenstance, when we stumble upon something new. Parser cites Arthur Koestler’s seminal work on creativity entitled “Act of Creation”: Discovery often means simply the uncovering of something which has always been there but was hidden from the eye by the blinkers of habit. Finally, the risk is that our online lives become just another echo chamber, akin to what’s happening in politics and TV. Conservatives watch Fox News; liberals watch CNN and MSNBC (Source: New Republic, 10/21/2014). Each side simply becomes more convinced of their ‘rightness’ and very little meaningful dialogue occurs. So keep on having a blast surfing the web, but be aware that more and more of what you see is being customized by hidden algorithms to present only things familiar to you. This isn’t a bad thing – most people would prefer going to a chain restaurant like Pizza Hut than a standalone, ‘unknown’ family place (hence, franchises). Familiarity brings comfort and peace of mind. Just know that to prime your creative juices, you should challenge yourself to be exposed to new-to-you ideas every now and again. Picking up the same newspaper everyone else is reading once in a while is an easy way to do just that.